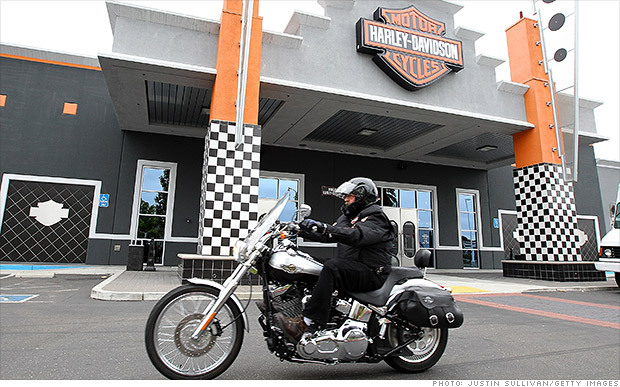 Harley Davidson stock roared Tuesday after the company reported a nice bump in profit. America's most iconic motorcycle brand is revving its engines -- and profits. Harley-Davidson (HOG) shareholders are loving it. Shares spiked 7% Tuesday after the Milwaukee, Wisconsin-based hog maker reported a 19% jump in first quarter profit. The growth was driven by what Harley-Davidson does best...selling big, powerful motorbikes. "They're producing some of the best motorcycles they've ever produced," said Gerrick Johnson, an analyst with BMO Capital Markets in New York. "The brand is resonating." Johnson said the company has done well solidifying its base with bikes for long distance touring, while at the same time creating products geared towards urban riding. Stronger overseas sales are also part of the story, although those may have been aided by a mild winter in Europe and a looming tax hike in Japan that may have encouraged extra purchases early in the year, Johnson said. The bike maker had a rough go beginning in 2007 when sales started plunging. Since then, its management, lead by CEO Keith Wandell, has moved aggressively to bring the company roaring back. A quick glance at the company's Facebook page shows the passion Harley fans all over the world have for this brand with many people sharing photos of events and rides. Harley-Davidson reported over $734 million in profit last year, a huge reversal from 2009, when it lost $55 million. The stock is trading over $72 today, up from its nadir in 2009 when it was down to nearly $8.